Browns Fashion is the iconic brand situated in five interconnecting Browns shops, situated in South Molton Street, London, where it first began in 1970. As one of the most important famous fashion emporiums! Browns shines a beacon so brightly for original designs and creativity, championing Graduate talent. Browns has no strict fashion philosophy other than the ruthless editing of the world's best womenswear and menswear collections. Joan Burstein (Mrs. B), who founded the shop with her husband Sidney, recognised what her fashion hungry customers wanted, needed and desired, then provided this on many different levels. Today the Browns brand and ethos is kept safe in the hands of Mrs. B's daughter Caroline and son Simon, CEO of Browns. Undoubtedly Browns is my first choice when it comes to womenswear as their vast collection of irresistible designer pieces and attention to detail, acquires a firm place in my heart. 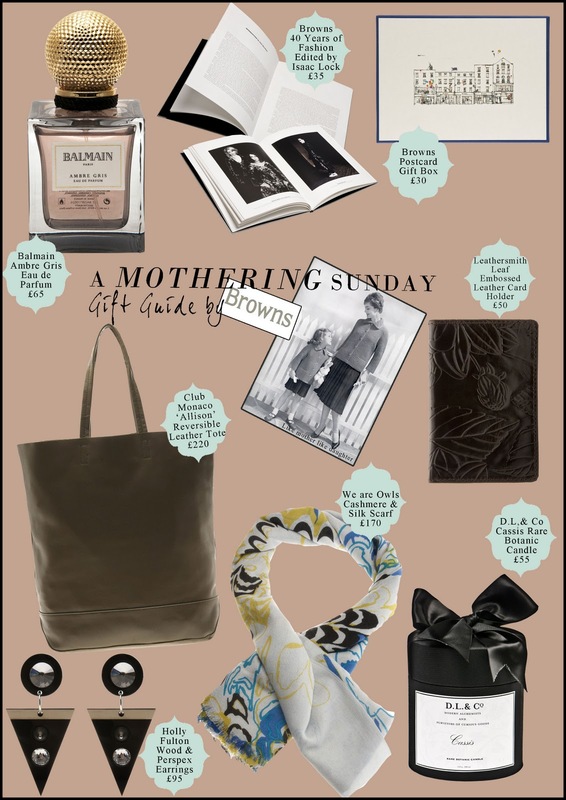 Take a look below at my favourite treats for Mothering Sunday.